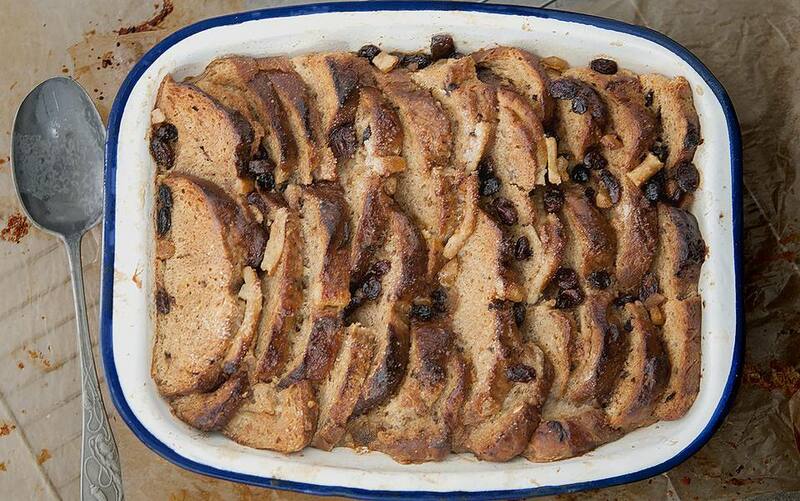 Bread and butter pudding is one of the easiest puddings to make and a favorite in both the Irish and British kitchen. Why? Not only is it easy, it is cheap to make as it is an excellent way to use up leftover bread, brioche, croissants or as in this recipe, hot cross buns. What a lovely way to use up these Easter treats. Hot cross buns are full of dried fruits and spices so those delicious flavors make a great pudding, especially when mixed with the custard-like sauce. Heat the oven 180C / 355 F /Gas 4. Grease a 1 litre (2-pint) pie dish with a little butter. Slice each hot cross bun thickly from top to bottom then take each slice and spread one side thickly with the remaining butter. Cover the base of the pie dish with overlapping slices of hot cross bun pieces with the butter side upwards. Lightly sprinkle the layer with a little nutmeg, cinnamon and a few raisins and sultanas. Fill the dish by repeating this layer one more time finishing by sprinkling a few raisins and sultanas on top. Beat the eggs with 3/4 sugar and vanilla extract in a large baking bowl until light, airy and pale in color. Gently pour the warm milk over the eggs and continue beating until all the milk is added. Pour the egg mixture slowly through a sieve, evenly over the bread until all the liquid is added. Carefully and gently press the surface with your hand, pushing the bread into the liquid. When you release your hand, the bread will spring back lightly. Sprinkle the remaining sugar over the surface then leave to one side for 30 mins to let the mixture rest. Bake the bread and butter pudding in the hot oven for 40 to 45 minutes, until the surface, is golden brown, the pudding has well risen and the eggs are set. Serve hot and with even more custard if you feel you want to; the pudding is also rather good with a nice dollop of vanilla ice cream on top too. Bread and Butter Pudding reheats well covered with aluminum foil in a hot oven; I also love it cold cut into large wedges - perfect for a lunch box.